Embrace FARM the support network for those affected by farm accidents will be hosting its 5th Ecumenical Remembrance Service in the Church of the Most Holy Rosary in Abbeyleix County Laois on Sunday 24th June 2018 at 2.00pm. Embrace FARM welcomes everyone who wishes to come to the service to acknowledge anyone who has been affected by a farming accident. This event now in its firth year has been held in Abbeyleix since 2014. The service is led by Catholic Bishop, Denis Nulty and Church of Ireland Bishop, Michael Burrows with local clergy from the Church of Ireland, Canon Harvey and Roman Catholic, Fr. Cummins. It is supported by farming organisations and agribusiness such as DAFM, ICMSA, ICSA, IFA, FBD, HSA, HSENI, Macra na Feirme, Teagasc, UFU, YFCU and by the Agri Media from the island of Ireland. 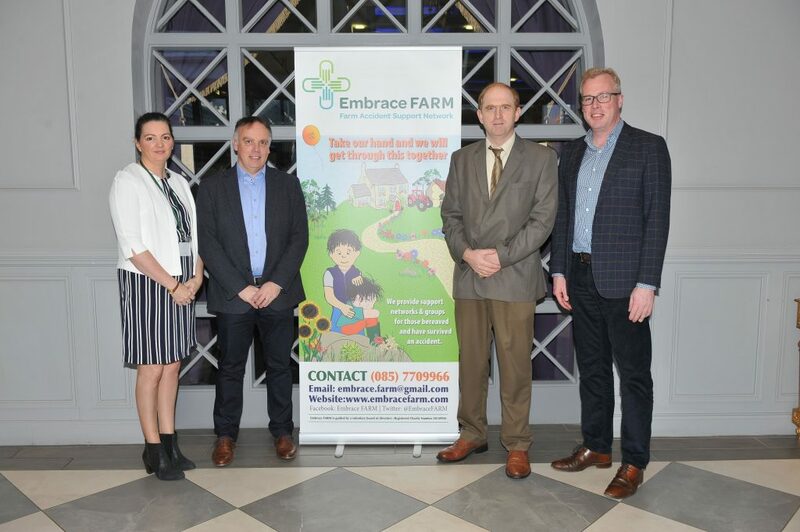 Embrace FARM will be represented by co-founders Norma & Brian Rohan and the voluntary board of directors who give their time freely in the development of the organisation with Norma and Brian. Embrace FARM were contacted by 130 families to have their loved ones remembered at this year’s Ecumenical Service. Behind these numbers is a father, mother, a husband, a wife, a child, a relative, someone important to a family and a community. This is a day to speak their names because they are a part of everything that we do. We speak their names because they will always will be a part of us. Light refreshments (sponsored) will be served at the Manor Hotel in Abbeyleix following the event, all are welcome. Embrace FARM is now fully integrated with the Charities Regulatory Authority in its operation. Pictured L2R at the Embrace Farm Accident Survivors Conference in Portlaoise-on November 25 were Norma Rohan, Director Embrace Farm, Seamus Bannon, ABP Food Group with Robert Leonard, Dept. of Agri & Food and Damien O’Reilly, RTE Countrywide programme. Photos by Roger Jones. No reproduction fee. Throughout 2017, Embrace FARM has continued its work in drawing awareness of those affected by farming accidents. It held residential family weekends in Portlaoise where several families and their children came to share their experiences and support one another in how losing a loved one has impacted and changed their lives. The first farm accident survivors’ conference was held in November 2017.
can affect more than just someone’s physical health and but their own and their families mental and emotional health. The day was also represented in a practical sense in what supports are there to help families adapt to life post an accident with a professional panel of legal counsel, insurance experts and machinery adaptions.